A general contractor can be held liable for an injury to a subcontractor’s employee when it is shown that the general contractor failed to ensure compliance with safety procedures/protection and the contractor ignored the non-use of provided safety equipment by a number of workers on its construction site. In our case, we successfully argued that the employee of a subcontractor who fell 13 – 17′ while unloading drywall from a lift was entitled to sue the general contractor even though the worker was not wearing mandated safety harness. Andrew Lefko: Public Act 103, known as “Andy’s Law” went into effect Oct. 1, 2001. 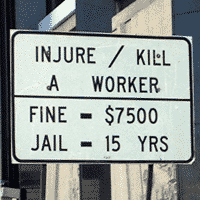 The law creates penalties of up to one year in prison for injuring and up to 15 years in prison for killing a highway construction or maintenance worker. It also imposes a maximum penalty of $7,500. The law is named for Andrew Lefko, a 19-year-old who was left paralyzed after being hit while working on I-275 in Metro Detroit. 2001 settlement in the amount of $4.1 Million Dollars for an injured construction worker, Andy Lefko, who was struck by a motor vehicle during the course of his employment while moving barrels in the traveled portion of a roadway.